This regulatory document is part of the CNSC's environmental protection series of regulatory documents. The full list of regulatory document series is included at the end of this document and can also be found on the CNSC's website. Environmental protection for nuclear facilities and activities is done in accordance with the Nuclear Safety and Control Act (NSCA) and the regulations made under it. The CNSC requires the environmental effects of all nuclear facilities or activities to be considered and evaluated when licensing decisions are made. In all cases, the EA (either under CEAA 2012 or under the NSCA), the environmental protection measures and the ERA (where required) are commensurate with the scale and complexity of the environmental risks associated with the nuclear facility or activity. REGDOC-2.9.1, Environmental Principles, Assessments and Protection Measures is intended to form part of the licensing basis for a regulated facility or activity. It is intended for inclusion in licences as either part of the conditions and safety and control measures in a licence, or as part of the safety and control measures to be described in a licence application and the documents needed to support that application. Early engagement with CNSC staff is encouraged for facilities or activities with potential interactions with the environment or for applicants uncertain as to their facility's or activity's potential for interaction with the environment. CNSC staff can provide facility- or activity-specific guidance to assist applicants and licensees. The requirements and guidance in this document are consistent with modern national and international practices addressing issues and elements that control and enhance nuclear safety. In particular, they establish a modern, risk-informed approach to environmental protection. Note: The intent of these requirements is not to replace or duplicate other federal, provincial or territorial, and municipal legislation with which licensees must comply. Where applicable, meeting the existing legislative requirements is adequate for meeting the requirements of this regulatory document. Environmental protection for nuclear facilities and activities is done in accordance with the Nuclear Safety and Control Act (NSCA) and the regulations made under the NSCA. This legislation includes provisions to ensure that licensees are meeting the CNSC's mandate to protect the environment and the health, safety and security of persons. The CNSC requires the environmental effects of all nuclear facilities or activities to be considered and evaluated when licensing decisions are made. This regulatory document clarifies how the CNSC undertakes an EA, either under the NSCA or, for designated projects, under the Canadian Environmental Assessment Act, 2012 (CEAA 2012). It clarifies the CNSC's expectations of applicants and licensees and provides guidance for protecting the environment and the health of persons. Note: The intent of these requirements is not to replace or duplicate other federal, provincial or territorial, and municipal legislation with which licensees must comply. Where applicable, meeting the existing legislative requirements is adequate for meeting the requirements of this regulatory document. The CNSC licensing process ensures that applicable regulatory documents are considered for licensing applications. The information required to comply with those regulatory documents may contribute to meeting the requirements in this document. All regulatory documents are available on the CNSC website. The applicant or licensee should engage with CNSC staff early in the planning process (before submission of a licence application) to identify the applicable regulatory documents and confirm an understanding of the licensing process. Protecting the environment is part of the CNSC's mandate. The CNSC requires the environmental effects of all facilities or activities to be evaluated and considered when licensing decisions are made (see figure 1). For each licensing decision, the CNSC (the Commission or a Designated Officer) must be satisfied that the applicant or licensee will make adequate provision for the protection of the environment and the health and safety of persons before a licence can be granted. The CNSC regulates nuclear facilities and activities in Canada to protect the environment and the health and safety of persons in a manner that is consistent with Canadian environmental policies, acts and regulations and with Canada's international obligations. The following sections of this regulatory document provide information on how to meet these principles. The CNSC assesses proposed alternative approaches and takes into account the views and proposals of the licensee concerning their individual situations. The CNSC's environmental protection safety and control area (SCA) covers measures that identify, control and monitor all releases of radioactive and hazardous substances and effects on the environment from facilities or as the result of licensed activities. The applicant's or licensee's environmental protection measures should address all aspects of the CNSC's environmental protection SCA that are relevant to the facility or activity. The scope and complexity within each measure should be commensurate with the nature and scale of the interactions with the environment that may result from the facility or activity. Note: The CNSC uses the term "environmental protection measures". The elements in these measures may be referenced by applicants and licensees in their "environmental protection programs". Applicants and licensees are not required to update their management system or other documents to reflect the term "environmental protection measures", but they must meet the requirements listed in this document. Figure 2 shows the cyclical nature of an ERA and how the ERA links to the effluent monitoring and environmental monitoring measures, illustrating how the ERA and the monitoring measures inform each other. These CSA standards apply to Class I nuclear facilities and uranium mines and mills. The CSA standards ensure that the risks associated with releases to the environment are continually assessed and mitigated; that releases are controlled and monitored; and that the environment is monitored. See section 4 for additional information on the application and implementation of these CSA standards, as well as other elements of environmental protection (for example, an environmental management system (EMS)). For facilities or activities other than Class I nuclear facilities and uranium mines and mills, the CNSC reviews every licence application to verify that there are no significant interactions with the environment (for example, for most Class II facilities, such as hospitals and universities, and for the use and transport of nuclear substances and radiation devices, there is no interaction with the environment). If the CNSC's review of the application determines that the facility or activity has potential interactions with the environment (such as planned releases of radioactive or hazardous substances to the environment) and that additional consideration of environmental protection measures is warranted, the applicant or licensee applies the information in section 4 to their environmental protection measures in a graded approach, commensurate with risk. The CNSC also regulates many facilities and activities that do not have any interactions with the environment (that is, the facility or activity has no direct releases to the environment). A licence application that describes the nature of the proposed licensed activities is considered sufficient for ensuring protection of the environment, provided that CNSC staff conclude the facility or activities do not interact with the environment. In this case, the remaining information in this document does not apply to such facilities or activities. Early engagement with CNSC staff is encouraged for facilities or activities with potential interactions with the environment. CNSC staff can provide facility- or activity-specific guidance to assist applicants and licensees. The CNSC cooperates with other jurisdictions and federal departments to protect the environment. Where appropriate, the CNSC may enter into formal arrangements to increase the effectiveness of environmental protection. For example, the CNSC holds memoranda of understanding (MOUs) with other federal departments (such as Fisheries and Oceans Canada, Environment and Climate Change Canada). A complete list of MOUs is available on the CNSC's website. When a proposed facility or activity must also comply with provincial or territorial legislation, the CNSC collaborates and coordinates the environmental protection processes where possible to increase efficiency and reduce duplication. The CNSC requires that the environmental effects of all nuclear facilities or activities be considered and evaluated when licensing decisions are made. All licence applications that demonstrate potential interactions with the environment are subject to an environmental assessment (EA), commensurate with the scale and complexity of the environmental risks associated with the facility or activity. EAs are carried out either under the Canadian Environmental Assessment Act, 2012 (an EA under CEAA 2012) or under the Nuclear Safety and Control Act (an EA under the NSCA). Early in the process, CNSC staff determine which type of EA applies by reviewing the information provided by the applicant or licensee in a project description (CEAA 2012) or licence application and supporting documentation. The CNSC conducts EAs under CEAA 2012 for designated projects listed in the Regulations Designating Physical Activities. EAs under the NSCA are conducted for projects not listed in those regulations or, for projects previously assessed under CEAA 2012 (or its predecessor CEAA 1992) but at the end of their licence term and for which the proposed licence renewal or amendments are not listed in those regulations. For both types of EAs, the core scientific basis used to satisfy either EA is the same and a lifecycle approach with public and Aboriginal participation is taken. For projects proposed to be carried out on federal lands as defined in section 66 of CEAA 2012, and requiring a decision by the CNSC as the federal authority , the Commission must determine whether the completion of a proposed project is likely to cause significant adverse environmental effects, in accordance with section 67 of CEAA 2012. For additional information, refer to Projects on Federal Lands and Outside Canada under the Canadian Environmental Assessment Act, 2012  and technical guidance document Projects on Federal Lands: Making a determination under section 67 of the Canadian Environmental Assessment Act, 2012 . CEAA 2012 may not apply in certain parts of Canada where settled Aboriginal land claim agreements have associated EA processes. Under CEAA 2012, the application may be subject to a federal, provincial, or territorial decision. For applicants proposing facilities or activities in areas of Canada subject to land claim agreements (such as the territories and parts of Quebec and of Newfoundland and Labrador), the CNSC may act as technical advisor and be an active participant at all stages of the EA process. The CNSC retains decision-making authority on all licensing matters under the NSCA and the Commission will use the information gathered in the EA process to inform its licensing decision under the NSCA. Where required, the applicant or licensee's ERA informs an EA under CEAA 2012 and forms the basis for an EA under the NSCA. CNSC staff use the information available in the ERA to assess the environmental effects of the facility or activity. An EA under CEAA 2012 is an assessment of the environmental effects of a designated project that is conducted in accordance with CEAA 2012. A designated project is defined in section 2 of CEAA 2012 and outlined in the Regulations Designating Physical Activities. An EA under CEAA 2012 is carried out early in the licensing process (at the beginning of the project's lifecycle) and serves as a planning tool. The process for an EA under CEAA 2012 is described in appendix A. Note: Because every facility or activity that successfully goes through the process of an EA under CEAA 2012 will eventually go through the process of an EA under the NSCA, CNSC staff endeavour to make one as rigorous as the other. For every EA under CEAA 2012, the facility or activity will eventually be reviewed as part of the CNSC's ongoing assessment of the environment under its environmental protection framework and an EA report for an EA under the NSCA will be produced at each phase of the licensing cycle. EAs under the NSCA are conducted for projects not listed in the Regulations Designating Physical Activities or, for projects previously assessed under CEAA 2012 (or its predecessor CEAA 1992) but at the end of their licence term and for which the proposed licence renewal or amendments are not listed in those regulations. The CNSC has adopted a policy for which the process of an EA under the NSCA (as outlined below) is used to continually assess the potential environmental effects and health effects for all licence applications that demonstrate potential interactions between a facility or activity and the environment. An EA under the NSCA is an ongoing assessment of the environment conducted at every phase throughout the lifecycle of the facility or activity to meet the NSCA`s requirements. At each phase (that is, for each licence application), CNSC staff consider all future phases of the lifecycle, taking into consideration available information. Similar to all other safety and control areas (SCAs), an EA under the NSCA is the process of ongoing verification related to the environmental protection SCA. An EA under the NSCA is a technical assessment by CNSC staff of information required under the NSCA and the regulations made under the NSCA to inform the licensing decision on whether the applicant or licensee will, in carrying on a licensed activity, make adequate provision for the protection of the environment and the health of persons. The assessment includes CNSC staff's recommendation on whether the applicant or licensee's environmental protection measures are adequate. An EA report for an EA under the NSCA is prepared by CNSC staff for each subsequent licence application for an existing licensed facility or activity. An EA under the NSCA is an ongoing environmental protection tool that the CNSC uses to assess the licensee's environmental protection measures throughout the CNSC's ongoing licensing, compliance monitoring and verification processes to inform the EA report. This assessment is commensurate with the scale and complexity of the environmental risks associated with the nuclear facility or activity. For an EA under the NSCA, CNSC staff conduct a technical review of the information (such as the licence application and its supporting documentation) that the applicant or licensee is required to submit to the CNSC through the established licensing process and, as part of the CNSC's ongoing regulatory oversight, a review of information on the licensee's environmental protection measures to ensure compliance with regulatory requirements. An EA under the NSCA is carried out within the CNSC's licensing process and its associated timelines. There is no decision on the EA report itself; however, the report's objective is to provide the necessary information under the environmental protection SCA so that a licensing decision under the NSCA can be made with confidence that the environment and the health of persons will be protected, as well as to increase transparency to the public and Aboriginal groups. To ensure the applicant or licensee understands all appropriate EA requirements, they are encouraged to seek CNSC guidance at the earliest possible stage of planning before submitting a licence application. CNSC staff use the information in the licence application and other documentation (such as the CNSC's independent environmental monitoring program, annual environmental monitoring reports, and CNSC staff compliance verification activities) to conduct an EA under the NSCA. The licence application must contain sufficient information to meet regulatory requirements and, as it relates to this document, demonstrate that the applicant or licensee will make adequate provision for the protection of the environment. During CNSC staff's technical review of the licence application, the applicant or licensee is responsible for addressing all issues identified by the CNSC. For every facility or activity, the applicant or licensee is required to submit information on their environmental protection measures commensurate with the scale and complexity of the environmental risks associated with the facility or activity (see section 4 for additional information). The set of environmental protection measures is an important component of the licence application. The applicant or licensee has the opportunity to provide responses to questions or concerns raised during public participation. This opportunity may be at a Commission proceeding (for example, a meeting, a hearing or an abridged hearing). Where required, the applicant or licensee's ERA supports environmental protection throughout the regulatory lifecycle of a facility or activity and forms the basis of an EA under the NSCA. The ERA is reviewed and revised periodically. Revisions to the ERA are informed by the accumulated site knowledge derived from operational experience, monitoring, special investigations, the incorporation of advances in scientific knowledge and, if available, Aboriginal traditional knowledge. As a result, the initial ERA evolves through the life of the facility or activity, remaining current and becoming increasingly more site-specific. The evolution of the ERA through accumulated monitoring data and new scientific knowledge decreases uncertainty, thereby enhancing the licensee's ability to assess the significance of deviations from predictions of environmental performance. This approach promotes continual improvement and informed adaptive management to protect the environment by providing an opportunity for early intervention (mitigation measures) to deviations in predicted environmental performance. For information on the requirements and guidance for performing an ERA (where required), refer to section 4. The CNSC can provide guidance, as appropriate or upon request. The EA information required by CNSC staff is based on the information that is required in the licence application to meet the requirements of the NSCA and the regulations made under the NSCA. CNSC staff perform a technical review of the licence application and supporting documentation. The scope of the technical review varies, depending on the complexity of the facility or activity, the anticipated interactions with the environment and the type of licensing decision being sought. CNSC staff document the EA findings of the technical review, in alignment with the facility- or activity-specific licensing process, to inform the licensing decision. The licensing decision is made by either the designated officer or the Commission. The EA findings include CNSC staff's recommendation to the decision-making authority on whether the licensee will make adequate provision for the protection of the environment and the health of persons. For licence applications of existing facilities or activities, the EA findings are an update on CNSC staff's review of the licensee's environmental protection measures to ensure the adequacy of the measures in continuing to protect the environment. For all proposed facilities and activities with environmental interactions, CNSC staff prepare an EA report documenting the findings of the EA under the NSCA. On a case-by-case basis, CNSC staff determine the appropriate level of detail and content of the EA report, based on and commensurate with the scale and complexity of the facility or activity and taking into consideration Aboriginal, public and regulatory interest. An EA report describes and summarizes the results of environmental monitoring, effluent and emissions monitoring and the risks to the environment and the public. Where available, environmental compliance monitoring data and the results of IEMP conducted near facilities are also included in the EA report. In particular, the EA report covers those elements of the facility or activity that are deemed to be of Aboriginal, public or regulatory interest. Any EA report that is prepared will be made available to the public on request. Documents being presented to the Commission for a licensing decision are made available to the public on request, subject to confidentiality requirements. Aboriginal groups and the public may be provided an opportunity to review the information and to provide their comments at a Commission proceeding. If warranted by public or Aboriginal interest, the EA report will be provided for information in advance of a Commission proceeding for consideration of the licence application. CNSC staff may organize an external review of the EA report. 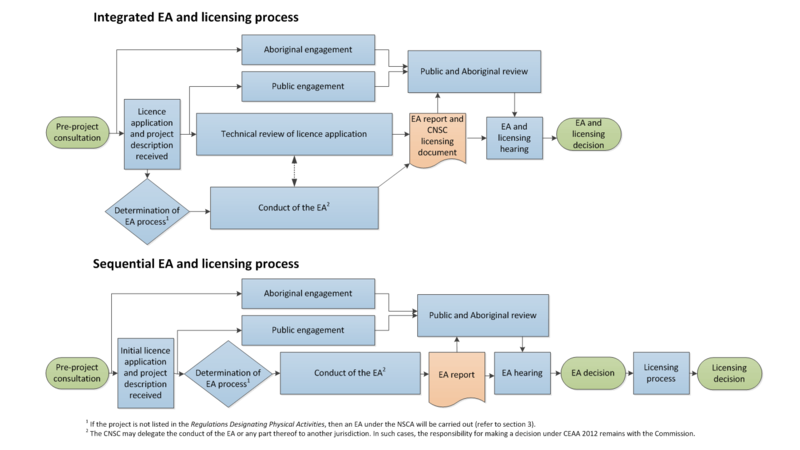 An EA under the NSCA allows for engagement on a case-by-case basis with the public and Aboriginal groups on the EA report before the licensing decision. For additional information, refer to REGDOC-3.2.2, Aboriginal Engagement . For Commission-delegated Designated Officer decisions, the Designated Officer considers the EA findings in the facility- or activity-specific licensing decision-making process. For Commission decisions, the Commission considers the EA findings in the facility- or activity-specific licensing process. When the licensing decision rests with the Commission, the Commission may consider the EA findings in a public hearing. During the hearing, the Commission may accept written or oral interventions. In advance of the hearing, the CNSC posts a notice on the CNSC website and to the CNSC subscription list, advertises in local media and sends a formal notice to identified Aboriginal groups and to participants in any facility- or activity-specific engagement activities. Following the hearing, the Commission makes its decision. The Commission Secretariat issues the Record of Decision. This record is posted on the CNSC website. A copy of the decision report is sent to the Aboriginal groups that participated in the review, and is available on request for other Aboriginal groups and members of the public. The necessary measures for environmental protection are determined on a facility- or activity-specific basis. Note: Not every facility or activity is required to have every environmental protection measure described in this section. The applicant or licensee may address certain requirements by demonstrating that a particular measure is not necessary or does not apply to that facility or activity. A licence application that describes the nature of the proposed licensed activities is considered sufficient for ensuring protection of the environment, provided CNSC staff conclude that the facility or activities do not interact with the environment. An ERA is a systematic process that identifies, quantifies and characterizes the risk posed by contaminants (nuclear or hazardous substances) and physical stressors in the environment. It is a practice or methodology that provides science-based information to support decision-making and to prioritize the implementation of mitigation measures. In conjunction with regulatory monitoring requirements, the ERA and its associated performance predictions serve as the basis for control and monitoring of releases, environmental monitoring, and any supplementary studies. All of these measures are interrelated and managed within the environmental management system (EMS). For additional information on an EMS, see section 4.6. The initial ERA for a new facility or activity is based on best estimates of the facility- or activity-specific characteristics. These characteristics are combined with sufficient environmental characterization (such as baseline) to support the assessment of potential interactions with the environment and the potential for associated environmental effects. These predictions establish the basis for the CNSC's compliance program for that facility or activity. The applicant or licensee incorporates the results of the initial ERA into their EMS, including the effluent and environmental monitoring measures. The predictions for physical disturbances and releases, and the associated environmental behavior and potential effects, are measured and tested using site-specific monitoring. The initial ERA submitted for licensing purposes for a new facility or activity is primarily predictive as it involves assessing the potential effects of a hypothetical facility or activity. As a facility or activity moves through its lifecycle, the ERA is periodically reviewed and revised (see section 4.1.2) using the accumulated site knowledge derived from operational experience, monitoring, special investigations, incorporation of advances in scientific knowledge and, where available, Aboriginal traditional knowledge. These "living" ERAs, which are informed by real data from monitoring programs (emissions, effluents, environmental) and current science, are used to assess if the original environmental impact predictions are exceeded or may be exceeded in the future. In this manner, the initial ERA evolves through the life of the facility or activity, remaining current and becoming an increasingly more powerful site specific tool. For Class I facilities and uranium mines and mills, the licensee shall conduct an ERA in accordance with CSA N288.6, Environmental risk assessment at Class I nuclear facilities and uranium mines and mills . The ERA shall be completed in a systematic, scientifically defensible manner that identifies, quantifies and characterizes the risk posed by releases of nuclear and hazardous substances and physical disturbances (stressors) on representative human and non-human biota. The licensee shall ensure that the ERA includes, as applicable to the facility or activity, both an ecological risk assessment (EcoRA) for the environment and a human health risk assessment (HHRA) for members of the public. For facilities or activities other than Class I nuclear facilities and uranium mines and mills, for which the CNSC has determined that there are direct interactions with the environment, the licensee should use the ERA process described in CSA N288.6  in a graded approach as appropriate to their circumstances. For many of these facilities, a simple screening assessment (as described in CSA N288.6) is adequate. Note: Although CSA N288.6 was developed for Class I facilities and uranium mines and mills, the methodology and general principles can be applied to other facilities and activities regulated by the CNSC. Early engagement with the CNSC is encouraged for facilities and activities that are not specifically addressed by CSA N288.6 . The CNSC can provide facility- or activity-specific guidance to assist licensees. The applicant or licensee shall identify facility characteristics and activities that may interact with the environment during the relevant phase of the facility or activity's lifecycle (for example, site preparation, construction, operation and decommissioning). The facility or activity characterization shall be of sufficient detail to assess the potential for effects arising from the proposed maximum quantities and anticipated volumes and flow rates for releases associated with the facility or activity. The applicant or licensee shall present a characterization of the baseline environment (that is, the environment before any development of the facility or activity has started) for any portion of the environment where the site characterization indicates potential for interaction. The applicant or licensee shall use the facility- or activity-specific characterization and the local environmental baseline characterization to identify the potential interactions between the facility or activity and the surrounding environment. Note that these identified interactions will become the focus of further stages within the ERA. The applicant or licensee shall use the potential environmental interactions to support their justification as to the level of complexity for the ERA in accordance with CSA N288.6, Environmental risk assessment at Class I nuclear facilities and uranium mines and mills . ERAs may be completed in a tiered manner reflecting the complexity of the disturbances and releases associated with the facility or activity and with the complexity or sensitivity of the surrounding environment. This tiered approach allows the rapid completion of simple screening risk assessments for facilities or activities with limited interaction with the receiving environment or the public. However, it also allows for progressively more complex quantitative assessments for facilities or activities when warranted by the severity and the spatial and temporal extent of potential effects (see figure 3). The revised ERA shall be used to assess the environmental performance of the facility or activity. The ERA shall also be used to predict continued future performance and associated environmental effects of the facility or activity. Controls on environmental releases are established to provide protection to the environment and to respect the principles of sustainable development and pollution prevention. The preventive and control measures shall be based on the potential risks to the environment that the facility or activity may pose. The effluent and emissions preventive and control measures are established on the basis of best industry practice, incorporating the application of BATEA, ALARA, process optimization, continuous improvement and the results of an ERA. After the facility or activity is licensed, BATEA assessments of pollution prevention and control technologies for releases are necessary only where effects exceed, or may exceed, those identified in the ERA and adaptive management involving the modification or reduction of releases of specific nuclear or hazardous substances is indicated. Assessments of techniques and the processes and procedures for ensuring effective effluent and emission control programs should be reviewed as part of the EMS requirement for continuous improvement. In conjunction with specific regulatory monitoring requirements, the ERA provides the technical foundation and structure for identifying the need for, and details of, effluent and emissions monitoring. The site-specific effluent and emissions monitoring is designed using the characterization of the locations, the anticipated volume, chemistry and flow rate of releases, and the proposed maximum quantities and concentrations of nuclear and hazardous substances (including their physical, chemical and radiological characteristics). For facilities and activities with no significant measurable releases to the environment, effluent and emissions monitoring is not required. In such cases, the licensee should demonstrate (through engineering or scientific methods) that appropriate barriers and practices are in place, and are monitored and maintained to prevent releases to the environment. For facilities and activities where the releases are of low risk or quantities are too low or too difficult to measure, monitoring is not required. The licensee may estimate emissions based on site-specific process chemistry and engineering principles. For Class I nuclear facilities and uranium mines and mills, the effluent and emissions monitoring shall address the requirements in CSA N288.5, Effluent monitoring programs at Class I nuclear facilities and uranium mines and mills . For Class I nuclear facilities and uranium mines and mills, the applicant or licensee shall assess and document the need for action levels. The applicant or licensee shall engage with CNSC staff on the requirements for establishing and implementing action levels for releases to the environment. For facilities and activities subject to the Uranium Mines and Mills Regulations, the licensee shall develop a facility-specific code of practice that includes, where appropriate, action levels for releases of nuclear and hazardous substances to the environment. The applicant or licensee shall assess for acute lethality any effluents that are released to water frequented by fish and that contain hazardous substances that could be considered deleterious under the Fisheries Act. Meeting existing federal or provincial requirements for toxicity testing shall be considered as satisfying this requirement. Otherwise, the method(s), frequency of testing and actions to be implemented as a result of a test failure shall be developed during licensing and shall be informed by existing standard practices applied to other industrial sectors. For facilities or activities other than Class I nuclear facilities and uranium mines and mills, for which the CNSC has determined that there are direct interactions with the environment, the licensee should use the process described in CSA N288.5  in a graded approach as appropriate to their circumstances. Note: Although CSA N288.5  was developed for Class I facilities and uranium mines and mills, the methodology and general principles can be applied to other facilities and activities regulated by the CNSC. The measurement and evaluation of environmental releases are key to verifying the efficacy of preventive and control measures. The overall process should include feedback mechanisms (both periodic and continual) to assess and implement actions to achieve performance targets. Monitoring should be conducted on a temporal scale relevant to the nature and complexity of the release (such as intermittent, continuous or batch), and should use a standard sampling methodology (or a non-standard methodology approved by CNSC staff) that is appropriate for the type of release (see figure 4). Effluent and emission monitoring addresses both the nature and quantities of releases of nuclear and hazardous substances (including wastes). Performance indicators for operational control, such as action levels (where required), should be established to serve as early indicators of potential loss of control or deviation from expected quality or quantity of releases. Performance indicators should be designed to initiate investigation of abnormal situations and, if necessary, result in corrective measures. Measurement and evaluation should be coordinated to permit timely corrective action. For facilities and activities other than Class I nuclear facilities and uranium mines and mills, for which the CNSC has determined that there are direct interactions with the environment, licensees should consider incorporating the development of similar environmental performance indicators, such as action levels, in their effluent and emission monitoring. For Class I nuclear facilities and uranium mines and mills, the licensee shall ensure that the environmental monitoring addresses CSA N288.4, Environmental monitoring programs at Class I nuclear facilities and uranium mines and mills . The licensee shall ensure that the environmental monitoring measures, plans and data provide sufficient information to assess exposure or potential effects on human health and the environment due to releases or physical perturbations resulting from the facility or activity. The licensee shall ensure that the results of the environmental monitoring are used to confirm that the effects on the environment are within the licensing predictions and adequate provisions are in place to protect the environment. For facilities or activities other than Class I nuclear facilities and uranium mines and mills, for which the CNSC has determined that there are direct interactions with the environment, the licensee should use the process described in CSA N288.4, Environmental monitoring programs at Class I nuclear facilities and uranium mines and mills  in a graded approach, as appropriate to their circumstances. Note: Although CSA N288.4  was developed for Class I facilities and uranium mines and mills, the methodology and general principles can be applied to other facilities and activities regulated by the CNSC. Monitoring for the presence of stressors (physical stressors or nuclear and hazardous substances) in the environment is sometimes more informative than monitoring the release at the source. The practice of monitoring ambient air quality is common for atmospheric emissions, especially fugitive or diffuse emissions (such as radon from ore pads). Such environmental monitoring is only necessary for those facilities or activities where the releases have the potential to be measurable within the environment. The monitoring details, with respect to the analytes being measured (physical stressors, nuclear and hazardous substances) and the media to be sampled (air, water, and so on), are dependent on the scale and complexity of the risks associated with the facility or activity. Radiological releases to the environment are controlled and monitored by the effluent and emissions control and monitoring and the environmental monitoring. Results of these monitoring and control activities are used to determine dose to members of the public. A human health risk assessment (HHRA) is completed as a sub-element of an ERA for both nuclear and hazardous substances. The Radiation Protection Regulations define prescribed dose limits for workers and members of the public, and require doses to be monitored by direct measurement or by estimation of the quantities and concentrations of any nuclear substance released as a result of a licensed activity. The Radiation Protection Regulations require licensees to implement a radiation protection program for protection of the public. The focus for radiation protection within the environmental protection framework is on radiological protection of the environment and the public. The development of a radiation protection program should be based on a sound policy, strategy and method for radiation protection and the achievement of ALARA, while taking into consideration the pathways and critical groups identified in the derived release limits (DRL) document (CSA N288.1, Guidelines for calculating derived release limits for radioactive material in airborne and liquid effluents for normal operation of nuclear facilities ). The licensee should design the radiation protection program commensurate with the radiological hazards associated with the licensed activities, based on an ERA and including radiation exposure and dose assessments. Groundwater protection is a specialized element of the overall environmental protection measures. As groundwater flow and associated contaminant transport can be more difficult to detect and delineate than that of surface water, specific requirements and guidance are provided here. Groundwater protection is an inter-related system of initiatives, processes and activities with the overall goal of protecting the quality and quantity of groundwater by minimizing interactions with the environment from activities associated with a nuclear facility, allowing for effective management of groundwater resources. For Class I nuclear facilities and uranium mines and mills, the licensee shall ensure that the need for and design of groundwater protection programs and associated monitoring address CSA N288.7, Groundwater protection programs at Class I nuclear facilities and uranium mines and mills . For facilities or activities other than Class I nuclear facilities and uranium mines and mills, for which the CNSC has determined that there are direct interactions with the environment, the applicant or licensee should implement a groundwater protection program and associated monitoring program in accordance with CSA N288.7, Groundwater protection programs at Class I nuclear facilities and uranium mines and mills  in a graded approach as appropriate to their circumstances. Note: Although CSA N288.7  was developed for Class I facilities and uranium mines and mills, the methodology and general principles can be applied to other facilities and activities regulated by the CNSC. In addition, the EMS should address environmental emergency preparedness. The EMS may be implemented within the licensee's integrated management system. For Class I nuclear facilities and uranium mines and mills, the licensee shall manage their environmental protection measures within an EMS that reflects the nature and complexity of their environmental protection measures. For facilities or activities other than Class I nuclear facilities and uranium mines and mills, for which the CNSC has determined that there are direct interactions with the environment, the applicant or licensee should manage their environmental protection measures within an EMS that reflects the nature and complexity of their environmental protection measures. Note: The CNSC does not consider certification to CAN/CSA ISO 14001 by an authorized registrar or other independent third party as solely sufficient for demonstrating compliance with the requirements. The CNSC evaluates all activities in relation to the requirements of this regulatory document. The CNSC's compliance verification focuses on the effectiveness of the EMS rather than on the licensee's adherence to CAN/CSA ISO 14001 (2004 edition or successor editions) [1, 2]. During the design of an EMS, the ISO documents provide guidance and information that may be useful; however, the licensee should note that, as a federal agency, the CNSC has adopted certain key concepts in environmental protection from other federal statutes. Where applicable, the CNSC expects licensees to apply the more-demanding meanings from federal legislation in the scope of their EMS. Pollution prevention is the key principle underlying the management of hazardous substances in Canada. Section 64 of CEPA 1999 defines the nature of toxic substances, explicitly defining unreasonable risk for certain scheduled substances. For other potentially hazardous substances that are not subject to legislation, unreasonable risk may be interpreted in terms of likely significant adverse effects. This concept is nearly equivalent to the CAN/CSA ISO 14001 [1, 2] concept of significant environmental effects. In the CNSC licensing process for Class I nuclear facilities and uranium mines and mills, an EA under the NSCA or CEAA 2012 process provides an initial framework for identifying and assessing the equivalent of ISO-significant environmental aspects in an appropriate context. This information can provide the initial foundation for the scope of the EMS. For nuclear substances, the Radiation Protection Regulations require exposure and doses to persons to be managed according to the ALARA (as low as reasonably achievable) principle, while taking social and economic factors into account. G-129, Keeping Radiation Exposures and Doses "As Low As Reasonably Achievable (ALARA)"  provides additional information. The Radiation Protection Regulations define risk for workers and the public through prescribed dose limits, and require doses to be monitored by direct measurement or by estimation of the quantities and concentrations of any nuclear substance released as a result of the licensed activity. The EMS framework should cover the assessment of releases and potential effects, the measures to control releases of nuclear substances and hazardous substances into the environment, and the measures taken to prevent or mitigate potential effects. The framework should be appropriate for the type of facility or activity and the licensing phase, and should be commensurate with overall regulatory requirements. In addition to the environmental protection measures described in detail earlier, the EMS should address environmental emergency preparedness. The licensee should address reporting requirements for potential or real emergency situations. For additional guidance, refer to REGDOC-2.10.1, Nuclear Emergency Preparedness and Response . The licensee should describe elements of the EMS related to worker training or qualifications, and the environmental protection obligations of workers. The licensee should demonstrate how training programs will enable workers to meet their obligations with respect to environmental protection. An EA conducted under CEAA 2012 is a planning tool. It is carried out early in the licensing process (before any licence is granted) and considers the entire proposed lifecycle of a project. An EA under CEAA 2012 includes information prepared by the applicant and CNSC staff, as well as comments received from Aboriginal groups and the public. After reviewing the EA, the Commission determines if the proposed project is likely to cause significant adverse environmental effects, taking into consideration the implementation of mitigation measures. "31 The construction, operation and decommissioning of a new uranium mine or uranium mill on a site that is not within the licensed boundaries of an existing uranium mine or uranium mill. 32 The expansion of an existing uranium mine or uranium mill that would result in an increase in the area of mine operations of 50% or more. (c)	facility for the processing or use, in a quantity greater than 1015 Bq per calendar year, of nuclear substances with a half-life greater than one year, other than uranium, thorium or plutonium. (c)	facility for the processing or use, in a quantity greater than 1015 Bq per calendar year, of nuclear substances with a half-life greater than one year, other than uranium, thorium or plutonium, that would result in an increase in processing capacity of 50% or more. 35 The construction, operation and decommissioning of a new nuclear fission or fusion reactor. 36 The expansion of an existing nuclear fission or fusion reactor that would result in an increase in power output of 50% or more. (b)	facility for the long-term management or disposal of irradiated fuel or nuclear waste. 38 The expansion of an existing facility for the long-term management or disposal of irradiated fuel or nuclear waste that would result in an increase in the area, at ground level, of the facility of 50% or more." The Minister of Environment and Climate Change Canada may also designate a physical activity that is not prescribed by the Regulations Designating Physical Activities if the project may cause adverse environmental effects or if there are public concerns related to those effects. Licensing, compliance and verification activities undertaken by CNSC staff ensure that the applicant has implemented the mitigation measures identified in the EA. Where applicable, the licensing, compliance and verification activities will also be used to ensure the implementation of a follow-up program. If an applicant proposes to carry on an activity following the completion of an EA under CEAA 2012, the applicant must complete the CNSC licensing process, including safety and control measures for protection of the environment and of the health and safety of persons. The applicant chooses whether to complete an EA under CEAA 2012 via an integrated approach with the CNSC licensing process, or a sequential approach. Under a sequential approach, the EA is conducted first, with a subsequent review of the licence application. This approach may be more appropriate when, for example, an applicant uses the EA to assess the feasibility of a project. CEAA 2012 does not set regulated timelines for EAs conducted by the CNSC. However (pursuant to the Class I Nuclear Facilities Regulations and the Uranium Mines and Mills Regulations), the CNSC is committed to completing this process within the 24 month federal timeline for a licensing decision under the integrated approach. Furthermore, CNSC staff's service standard for completing an EA under CEAA 2012 under a sequential approach is also a 24 month federal timeline. Adherence to this schedule, for both integrated and sequential approaches, is facilitated by the completeness of information received from applicants, and the process will begin when the notice of commencement is posted. Note: The 24 month federal timeline applies to CNSC activities, and not to the time periods required for steps outside the CNSC's control, such as time the applicant needs to prepare technical studies or to respond to requests for additional information or circumstances that are specific to the project. Figure 5 and table A outline the CNSC's process for completing an EA under CEAA 2012. Note: Public and Aboriginal group participation opportunities, carried out by both the CNSC and the applicant, occur throughout this process. The process for an EA conducted by the CNSC under CEAA 2012 includes the following key steps. To facilitate planning, the CNSC encourages applicants and licensees to submit their project descriptions as early as possible. The CNSC may allow some applicants to apply a graded approach to the requirements for a project description as set out in the Prescribed Information for the Description of a Designated Project Regulations. This possibility should be discussed and determined during pre-project engagement. For early engagement and planning purposes, the CNSC may initiate early discussions with other federal, provincial or territorial authorities and Aboriginal groups as soon as an applicant indicates their intent to seek regulatory approval for a proposed project. The objective of early engagement is to support a more timely and efficient process for the EA under CEAA 2012. For more information, see step 4, below. For a sequential approach applied to an existing facility with proposed new activities (that requires a licence amendment), the applicant submits a project description only. The CNSC may request additional information, even if the project description generally conforms to these regulations, as required to complete the EA determination. A nuclear project undergoes an EA under CEAA 2012 if it meets the description of a designated project in the Regulations Designating Physical Activities or if it has been designated by the Minister of Environment and Climate Change Canada. Using the information provided in the project description, the CNSC determines if the project is a designated project, and completes an EA determination memorandum that documents the findings. If an EA under CEAA 2012 is required, the CNSC informs the applicant. If an EA under CEAA 2012 is not required, the applicant must still meet CNSC licensing requirements before the licence is issued, including submission of information that allows CNSC staff to conduct an EA under the NSCA to ensure the applicant or licensee will, in carrying out the project, ensure the protection of the environment and of the health of persons, as described in section 3. As the sole federal responsible authority for nuclear projects, the CNSC contacts provincial jurisdictions to determine if there are any other provincial EA requirements. Where applicable, the CNSC works with other jurisdictions to determine if their EA requirements can be addressed through a single EA process (to reduce duplication and provide regulatory efficiency). Relevant federal and provincial EA agreements provide direction regarding jurisdictional roles and responsibilities in the assessment of such projects. The CNSC may delegate the conduct of an EA or any part thereof to another jurisdiction. In such cases, the responsibility for making a decision under subsection 52(1) of CEAA 2012 remains with the Commission. Delegation of EA related matters for a given project are determined on a case-by-case basis in accordance with section 26 of CEAA 2012. The CNSC contacts other federal authorities to determine if additional regulatory decisions are required to allow the project to proceed. The CNSC also engages the appropriate federal authorities to determine whether they can provide specialist or expert information or knowledge to support the conduct of the EA. The CNSC ensures that a notice of commencement of an EA is posted on the Canadian Environmental Assessment Registry (CEAR). This notice provides a brief description of the project, the jurisdictions involved, and CNSC contact information. The CNSC posts a similar notice on the CNSC website, and provides a link to the notice of commencement on CEAR. The CNSC also distributes the notice to its subscription list and sends a formal notice to identified Aboriginal groups. Aboriginal consultation activities are integrated in the EA process to the extent possible. For more information, see REGDOC-3.2.2, Aboriginal Engagement . The CNSC ensures that the public is provided with an opportunity to participate in the EA. The breadth and timing of public participation is at the discretion of the CNSC. For example, a public review period may be conducted on the project description to solicit the views of the public, Aboriginal groups and other stakeholders to help inform the conduct of the EA under CEAA 2012. Other opportunities could include public outreach sessions (such as open houses or information sessions); a public review on documentation (such as the environmental impact statement (EIS) or EA report); or participation in a public hearing on the EA. Under subsection 19(1) of CEAA 2012, the CNSC is required to consider certain factors in the EA under CEAA 2012 (see subsection A.3). The Commission determines the scope of these factors in a Commission proceeding. CNSC staff will notify the applicant of the final scope of factors determined by the Commission, including any additional requirements that are to be included in the conduct of the technical studies and EIS. The conduct of the technical studies and preparation of an EIS are typically delegated to the applicant. The document Generic Guidelines for the Preparation of an Environmental Impact Statement pursuant to the Canadian Environmental Assessment Act, 2012  informs applicants of the information requirements for the preparation of an EIS for a project that requires an EA under CEAA 2012. The applicant submits the EIS and any supporting technical studies to the CNSC for a technical review. Note: To meet CEAA 2012 requirements, the applicant should complete a baseline environmental characterization (see appendix B), and an environmental effects characterization (see appendix C). Specific requirements under CEAA 2012 are described in subsection A.3. CNSC staff and, where applicable, other federal and provincial authorities perform an in depth technical review of the EIS and supporting technical studies. If certain areas need to be clarified, confirmed or improved based on the technical review, the CNSC may ask the applicant to provide additional information to resolve these issues. When CNSC staff are satisfied that the applicant has adequately addressed all information gaps, the technical review is considered to be complete. The CNSC must ensure that an EA report is prepared. The EA report includes CNSC staff's conclusions regarding the potential environment effects, the proposed mitigation measures, and whether the project is likely to result in significant adverse environmental effects, as well as follow-up program requirements. CNSC staff draft the EA report, which synthesizes the applicant's technical information and takes into account the results of the technical review, including any comments received from other parties. The CNSC may request other federal agencies to review the EA report or to provide expert information or knowledge. Comments received will be considered in the development of the EA report. CNSC staff prepare a document summarizing the EA report's conclusions and recommendations, and outlining the EA-related decisions that the Commission needs to make. This document and the EA report are submitted to the Commission, along with any public comments received (including how the CNSC staff addressed the comments). The Commission uses this information to inform its decision. For public hearings, a notice of public Commission hearing is posted on the CNSC website at least 60 days before the scheduled hearing to inform the public and Aboriginal groups with hearing information, including information on how to intervene at the hearing. The CNSC also sends a copy of the notice to identified Aboriginal groups. This procedure enables interested parties to request intervenor status from the Commission for the public hearing and to send their comments on the EA report. Public hearings are usually held at the CNSC headquarters in Ottawa, but the Commission may decide to hold such a hearing in a community in the vicinity of the proposed project. The exact nature of the public hearing depends on whether the project is following an integrated or sequential EA and licensing process. This information is provided in the notice of public Commission proceeding. Where other federal authorities provided expert information or knowledge during the conduct of the EA under CEAA 2012, the Commission may request their participation in the public hearing. Following the public hearing, the Commission makes a decision, based on the EA, on whether the project is likely to cause significant adverse environmental effects, taking into account mitigation measures that were identified during the EA. This decision must be made before a licensing decision can be made on allowing the project to proceed. If the Commission concludes that a project is not likely to cause significant adverse environmental effects in accordance with subsection 52(1) of CEAA 2012, the Commission (in accordance with section 53) must establish through the licensing process, the mitigation measures and follow-up activities that the applicant must implement. If the Commission concludes that a project is likely to cause significant adverse environmental effects in accordance with subsection 52(2) of CEAA 2012, the Commission refers to the Governor in Council the matter of whether those effects are justified in the circumstances. The Commission's decision is published on the CNSC website and the CEAR. Aboriginal groups and members of the public who have expressed an interest in a particular project may be directly notified of the decision. Where the information is common to both the EIS and the licence application, the applicant may provide the information in either the application or the EIS, with appropriate cross-referencing between the submissions. The applicant shall clearly indicate where the requirements of both the NSCA and CEAA 2012 are addressed. Pursuant to subsection 19(2) of CEAA 2012, the scope of the factors to be taken into account under paragraphs 19(1)(a), (b), (d), (e), (g), (h) and (j) is determined by the Commission, as a responsible authority. The EIS and supporting technical studies are completed to meet the requirements of CEAA 2012, paragraphs 19(1)(a), (b), (d), (e), (f), (g), (h) and, if appropriate, (i) and (j) in accordance with the scope of these factors as determined by the CNSC. The completion of the EIS and, as necessary, supporting technical studies is typically delegated to the applicant in accordance with section 23 of CEAA 2012. This regulatory document provides requirements and guidance to support project planning and early development of these documents by the applicant. These requirements and guidance do not negate the importance of pre project engagement or the potential for project-specific EA guidelines. Paragraph 19(1)(f) of CEAA 2012 states that the EIS shall identify the purpose of the project (defined as what is to be achieved by carrying out the project). For further guidance, consult Addressing "Purpose of" and "Alternative Means" under the Canadian Environmental Assessment Act, 2012 . Paragraph 19(1)(g) of CEAA 2012 states that the EIS shall identify and describe alternative means to carry out the project that are, from the perspective of the applicant, technically and economically feasible. As identified by the proponent, the alternative means include options for locations, development, and implementation methods, routes, designs, technologies, mitigation measures, and so on. Alternative means may also be related to the construction, operation, expansion, decommissioning and abandonment of a physical work. The EIS should also describe the environmental effects of each alternative means. The criteria used to identify alternative means as unacceptable, and how these criteria were applied, should be described, as should the criteria used to examine the environmental effects of each remaining alternative means to identify the preferred alternative. Paragraph 19(1)(a) of CEAA 2012 states that the EA must take into account the environmental effects of the designated project. The environmental effects that must be considered in an EA under CEAA 2012 are also requirements under the NSCA. As described in section 4, the applicant should conduct an ERA in accordance with CSA 288.6, Environmental risk assessment at Class I nuclear facilities and uranium mines and mills . Paragraph 19(1)(a) of CEAA 2012 states that malfunctions and accidents shall be assessed in the EA. Malfunctions and accidents should be separated into radiological and non-radiological (conventional). The applicant should provide an assessment of potential health and environmental effects resulting from postulated radiological and conventional malfunctions or accidents. The EIS should also include any mitigation measures such as monitoring, contingency, clean up or restoration work in the surrounding environment that would be required during or immediately following the postulated malfunction and accident scenarios. The EIS should provide a description of postulated malfunction and accident sequences leading to a radiological or non-radiological release considering, as appropriate, internal events, external events and human-induced events, including their frequency and an explanation of how these events were identified, and any modeling that was performed. The applicant can use a bounding approach or use facility- or activity-specific information (for example, design, operation, projected environmental releases) in the assessment of radiological accidents and malfunctions. If a bounding approach is used, the applicant should provide a detailed rationale for the selection of each bounding scenario. The EIS should include the source, quantity, mechanism, pathway, rate, form and characteristics of contaminants and other materials (physical and chemical) likely to be released to the surrounding environment during the postulated malfunctions and accidents. Note: Malfunctions and accidents are reviewed in depth under the NSCA for licensing purposes (for example, under REGDOC-2.4.1, Deterministic Safety Analysis , REGDOC-2.4.2, Probabilistic Safety Assessments for Nuclear Power Plants  and RD-346, Site Evaluation for New Nuclear Power Plants ). These scenarios should be taken into consideration by the applicant when designing environmental protection measures (see section 4). If applicable, the applicant should use operating experience (OPEX) to identify any past abnormal operations, accidents and spills to the extent that they are relevant to the current assessment for the purposes of identifying malfunction and accident scenarios to be assessed. Paragraph 19(1)(a) of CEAA 2012 states that the applicant shall assess any residual adverse environmental effects of the project in combination with other past, present or reasonably foreseeable projects and/or activities within the study area. The applicant should explain the approach and methods used to identify and assess cumulative effects. The approach and methods should be consistent with Assessing Cumulative Environmental Effects under the Canadian Environmental Assessment Act, 2012 . Paragraph 19(1)(b) of CEAA 2012 states that the applicant shall assess the significance of any residual effects that persist, taking into consideration the proposed mitigation measures. These residual effects are identified during the ERA or a characterization of the environmental effects. In the EIS, the applicant should include a detailed analysis of the significance of each residual effect. The applicant should clearly explain the method and definitions used to describe the level of the residual adverse effect (for example, low, medium, or high) for each of the issues. The applicant should also describe any cumulative environmental effects that are likely to result from the designated project in combination with other physical activities that have been or will be carried on and how these levels were combined to reach an overall conclusion on the significance of the adverse effects for each valued component (VC). The method used to describe the level of the adverse effect should be transparent and reproducible. The EIS should identify additional criteria used to assign significance ratings to any predicted adverse effects. It should contain clear and sufficient information to enable the CNSC and the public to understand and review the applicant's judgement of the significance of effects. The applicant should define the terms used to describe the level of significance. In assessing significance against the criteria, the EIS should, where possible, employ relevant existing regulatory documents, environmental standards, guidelines or objectives such as prescribed maximum levels of emissions or discharges of specific hazardous substances into the environment or maximum acceptable levels of specific hazardous substances in the environment. The applicant should characterize the socio-economic environment and identify all indirect socio-economic effects. An indirect effect is a secondary environmental effect that occurs as a result of a change that a project may cause to the environment. Paragraph 5(2)(b) of CEAA 2012 refers to any change to the environment caused by the project on health and socio-economic conditions, physical and cultural heritage, or any structure, site or thing that is of historical, archaeological, paleontological or architectural significance. For additional guidance, refer to Technical Guidance for Assessing Physical and Cultural Heritage or any Structure, Site or Thing that is of Historical, Archeological, Paleontological or Architectural Significance under the Canadian Environment Assessment Act, 2012 . Subsection 19(3) of CEAA 2012 states that community and Aboriginal traditional knowledge may be considered in the EA. CNSC staff will provide guidance to the applicant at the earliest possible stage in the EA process concerning the extent to which community and Aboriginal traditional knowledge shall be considered in the EA. Paragraph 19(1)(h) of CEAA 2012 states that the EIS shall take into account how the environment could adversely affect the project. The applicant shall also take into account any potential effects of climate change on the project, including an assessment of whether the project might be sensitive to changes in climate conditions during its lifecycle. Some adverse environmental conditions are flooding, severe weather, biophysical hazards (such as algae), geotechnical hazards and seismic events. Paragraph 19(1)(e) of CEAA 2012 states that the EIS shall include a framework or preliminary program upon which EA follow up actions will be managed throughout the life of the project. The applicant should design the follow up program to verify the accuracy of the EA predictions and to determine the effectiveness of the measures implemented to mitigate the potential adverse environmental effects of the project. The applicant should also design the follow up program to incorporate pre-project information that would provide the baseline data; compliance data such as established environmental quality critera; regulatory documents, standards or guidelines; and real time data consisting of observed data gathered in the field. As part of the follow up program, the applicant should describe the compliance reporting methods to be used, including reporting frequency, methods and format. Note: The CNSC, in collaboration with other federal authorities (where applicable), verifies and monitors all EA follow up activities through the CNSC licensing and compliance process. EA follow up monitoring activities may be integrated within the applicant's environmental protection measures. For a new licence, the applicant should use the information in this appendix to develop a characterization of the baseline environment. During the lifecycle of the facility or activity, the licensee should use this information to review and update the characterization, and also use the information in appendix C to document and predict the future environmental effects compared to this baseline characterization. For additional information, see appendix D for a sample matrix for mapping the facility/activity-environmental-component interactions. The atmospheric environment includes the climate conditions at the site and in the local and regional study areas. It includes the seasonal variations in weather conditions within the study areas, to allow the assessment of effects on the facility or activity. The applicant or licensee should provide a description of the existing ambient air quality in the study areas, with emphasis on characterizing radiological and non-radiological analytes. The description should include meteorological information such as air temperature, relative humidity, precipitation, wind speed and direction, atmospheric pressure, and solar radiation. It should also include the occurrence of weather phenomena (for example, lightning, temperature inversions and fog). Special consideration should be given to the analysis of extreme and rare meteorological phenomena (for example, tornadoes).Uncertainties should be described and taken into account when discussing the reliability of the information presented. The applicant or licensee should describe the influence of regional topography or other features that could affect weather conditions in the study areas. The baseline information should be sufficient to support the use of an atmospheric dispersion model to conduct the site-specific ERA and to support an assessment of the effects of the environment on the project (for example, tornadoes). The surface water environment includes all surface water features and hydrology that affect surface water at the site or in the local and regional study areas. The applicant or licensee should include delineation of drainage basins at appropriate scales. When documenting the water quality of all surface water, the applicant or licensee should demonstrate the use of appropriate sampling and analytical protocols, for the range of analytical parameters with the potential to be influenced by the facility or activity. This information should be presented using tables, maps and figures to provide an understanding of surface water characteristics and conditions at the site and in the local and regional study areas. The applicant or licensee should describe hydrological regimes within the drainage basin, including seasonal fluctuations and year-to-year variability of all surface waters. The applicant or licensee should assess normal flow, flooding and drought properties of water bodies as well as the interactions between surface water and groundwater flow systems. The applicant or licensee should describe all water sources used for drinking water in the area, including source water intakes for drinking water treatment facilities. The baseline information should be sufficient to support the use of an aquatic dispersion model to conduct the site-specific ERA and to support an assessment of the effects of the environment on the facility or activity (for example, flooding). The applicant or licensee should document the sediment quality of all water bodies to be affected by the facility or activity, demonstrating the use of appropriate sampling and analytical protocols, for the range of analytical parameters with the potential to be influenced by the facility or activity. This information should provide an appropriate understanding of sediment characteristics and conditions on the site and in the local and regional study areas. The study design should be fully described, including the allocation of samples in space and time, measurement methods and results. The applicant or licensee should include an assessment of any limitations or gaps in the quality and extent of baseline data and methods, as well as the method(s) by which they have been addressed. The aquatic environment includes the aquatic and wetland species at the site and within the local and regional study areas, including the flora, fauna and their habitats. The applicant or licensee should seek information from relevant authorities (such as Environment and Climate Change Canada (ECCC), Fisheries and Oceans Canada (DFO) and provincial or territorial authorities) on aquatic and wetland species and habitat for the local and regional study areas. The applicant or licensee should also undertake independent studies to gather the necessary information. The applicant or licensee should include a description of the food chain and food web dynamics as a habitat component as this relates to fish populations, and potential effects resulting from the facility or activity (such as impingement and entrainment). The applicant or licensee should provide detailed habitat mapping that demonstrates habitat usage by fish within the study areas. This information should include depth profiles, substrate mapping, water temperature profiles, and a description of known and potential habitat usage (such as spawning, nursery, rearing, feeding and migratory) by fish that occur in the study areas. The applicant or licensee should identify any biological species of natural conservation status (that is, rare, vulnerable, endangered, threatened or uncommon at a federal, provincial or municipal level) and their critical habitats, if identified. The applicant or licensee should provide baseline characterization of radionuclide and hazardous substance levels in aquatic biota to support human and ecological risk assessment. The applicant or licensee should fully describe the study design, including the allocation of samples in space and time, measurement methods and results. The applicant or licensee should include an assessment of any limitations or gaps in the quality and extent of baseline date and methods, as well as the method(s) by which they have been addressed. The geological and hydrogeological environment includes the bedrock and overburden geology at both the local and regional scales. The applicant or licensee should characterize the geomorphology, topography, quaternary geology and soil characteristics, structural geology, petrology, geochemistry, economic geology and hydrogeology. The applicant or licensee should also describe the geomechanical properties that apply to the region and at the site that will be disturbed. The applicant or licensee should provide the geotechnical properties of the overburden, including shear strength and liquefaction potential, to allow for the assessment of slope stability and bearing capacity of foundations under both static and dynamic conditions. The description of the structural geology should include regional, local and site-specific documentation of fractures and faults. It should include a description of primary geological features and deformation fabrics both at the site and within the local and regional study areas. If applicable, the applicant or licensee should describe the coastal geomorphology and should include the characteristics of any lakefront or ocean bluffs, shoreline, and both near-shore zone and offshore zones. The baseline characterization should be sufficient to assess effects of the environment on the facility or activity (for example, seismic effects). The applicant or licensee should present a geological model that incorporates all overburden and bedrock information. If extrapolation is required to derive the stratigraphy, the applicant or licensee should explicitly discuss the uncertainties and the need for additional field investigations to reduce those uncertainties. The applicant or licensee should describe the geotechnical and geophysical hazards including the consideration of subsidence, uplift, seismicity (and active faulting), and consider the potential for movement at the ground surface (including co-seismic rupture) and earthquake ground motions. A seismic hazard assessment should be provided. Where appropriate, the narrative descriptions should be supplemented by geological maps, figures, cross-sections, borehole logs and photographs (with specific location information). The applicant or licensee should describe the hydrogeology at the site and in the local and regional study areas. The description should characterize the physical and geochemical properties of all overburden and bedrock hydrogeological units (from the ground surface to the uppermost basement unit, which is site dependent). Units may be characterized as aquifers or aquitards, and unit descriptions should include their geochemical characteristics, vertical and lateral permeabilities, transport mechanism (diffusion versus advection) and directions of groundwater flow. The applicant or licensee should identify the groundwater recharge and discharge areas, and describe in detail the groundwater interactions with surface waters. The applicant or licensee should present a conceptual and numerical hydrogeological model that discusses the hydrostratigraphy and groundwater flow systems. The applicant or licensee should provide a description of baseline groundwater quality at the site and in the local study area. The applicant or licensee should also describe local and regional potable groundwater supplies, including their current use and potential for future use. The terrestrial environment includes flora and fauna, their habitats, any wildlife corridors and the soil. The applicant or licensee should describe the terrestrial species at the site and within the local and regional study areas, including flora, fauna and their habitat. The applicant or licensee should identify all biological species at risk (that is, endangered, threatened, special concern, extirpated at a federal, provincial or municipal level) known to occur in the area or where the site is within the range of the species. The applicant or licensee should describe the presence and importance of wildlife habitat within the study areas, including critical habitats for listed species (if identified). The applicant or licensee should also describe any wildlife corridors and physical barriers to movement. The applicant or licensee should identify all protected and conservation areas established by federal, provincial and municipal jurisdictions (for example, wilderness areas, parks, sites of historical or ecological significance, nature reserves, federal migratory bird sanctuaries and wildlife management areas). The applicant or licensee should describe the existing soil quality (including hazardous and radiological substance concentrations) for all study areas, as well as any additional soil quality parameters potentially relevant for modelling purposes (such as transport and bioavailability of contaminants of potential concern). The applicant or licensee should provide baseline characterization of radionuclide and hazardous substance levels in vegetation and other non-human biota to support human and ecological risk assessment. The characterization should also take into consideration the baseline conditions of other applicable environmental components (such as the atmospheric environment). The applicant or licensee should undertake independent studies to gather the necessary information as appropriate. The applicant or licensee should describe field studies in terms of representativeness of the target populations where possible. The applicant or licensee should fully describe the design of the study, including the allocation of samples in space and time, measurement methods and results. The ambient radioactivity arises from the sources, their activity levels and their origin, for all applicable environmental media (including air, soil, food, water, aquatic sediments and plant or animal tissue). The applicant or licensee should describe the ambient radiological conditions at the site and in the local and regional study areas. The applicant or licensee should include information on the existing conditions, including an inventory of sources, their activity levels and their origin (natural or anthropogenic), for all applicable environmental media. The applicant or licensee should fully describe the design of the study, including the allocation of samples in space and time, measurement methods and results. The description should include an assessment of any limitations or gaps in the quality and extent of the baseline data and methods, as well as the method(s) by which they have been addressed. The potential effects of the facility or activity on human health include both radiological sources and non-radiological contaminants. The applicant or licensee should describe the current health profiles of the communities likely to be affected by the facility or activity, including information on population health of the communities in the local and regional study areas. The applicant or licensee should provide, to the extent available, information on current consumption of locally grown harvests and country foods, and the quality by food type, amounts consumed, parts consumed (whole body or specific organs). Aboriginal land and resource use includes lands, waters and resources of specific value; traditional activities and lifestyle; and traditional dietary habits. Traditional land use may include areas where traditional activities such as establishing seasonal camps, camping, travel on traditional routes, gathering of country foods and medicines (hunting, fishing, trapping, planting and harvesting) are being carried out. Traditional land use also includes spiritual sites of significance to Aboriginal people. The applicant or licensee should identify the lands, water and resources of specific social, economic, archaeological, cultural or spiritual value to Aboriginal people, including established and asserted Aboriginal or treaty rights that may be affected by the facility or activity. The applicant or licensee should describe Aboriginal land and resource use at the site and in the local and regional study areas. The applicant or licensee should identify traditional activities, including activities for food, social, ceremonial and other cultural purposes, in relation to such lands, waters and resources with a focus on the current use of lands, waters and resources for traditional purposes. The applicant or licensee should describe the traditional dietary habits and dependence on country foods and harvesting for other purposes, including harvesting of plants for medicinal purposes. The analysis should focus on the identification of potential adverse effects of the facility or activity on the ability of future generations of Aboriginal people to pursue traditional activities or lifestyle. The licensee should have already developed a characterization of the baseline environment (see appendix B) and should use the information in this appendix to document the environmental effects of a facility or activity. For additional information, see appendix D for a sample matrix for mapping the facility/activity-environmental-component interactions. The licensee should characterize the effects of the facility or activity on the atmospheric environment during all phases of the lifecycle for the facility or activity, including postulated accident and malfunction scenarios. The licensee should identify and characterize all atmospheric emissions (radiological and non-radiological) expected to be generated during all phases of the lifecycle for the facility or activity, including postulated accident and malfunction scenarios. This information should include average and maximum emissions from planned discharges, point sources and fugitive (non point source) releases (including greenhouse gases). The licensee should complete modelling that incorporates baseline (or existing ambient) air quality in combination with the predicted site-specific atmospheric characteristics (such as shoreline fumigation) to assess potential effects on air quality, the transport of atmospheric contaminants and any associated exposure to humans and non-human biota receptors. The licensee should describe predicted effects of noise on terrestrial and aquatic species as well as on nearby residents and communities. The description should include both daytime and nighttime noise levels and tonal noise. The predicted sound levels should be compared against baseline levels and any guidelines published by recognized organizations. The licensee should describe the effects of the facility or activity on the surface water environment during all phases of the lifecycle for the facility or activity, including accident and malfunction scenarios. For all phases of the lifecycle for the facility or activity, the licensee should describe the effects of the facility or activity on aquatic flora and fauna, and include a full accounting of effects on species of natural conservation status and their habitat. This evaluation should be based on results of field monitoring studies or predictions from an ecological risk assessment. The description should be clear on how predicted effects to the biota exposed to the stressor compare to the expected reference condition for unexposed biota on a biological population basis, taking natural variation into account. Predictions of effects should include sufficient detail to allow follow-up verification. Under the NSCA, the CNSC assesses the ongoing operation of nuclear facilities and activities to ensure protection of the environment and the health and safety of persons. Under the Memorandum of Understanding between CNSC and Fisheries and Oceans Canada (DFO), the CNSC is responsible for conducting reviews of licence applications to assess the potential effects on fish and fish habitat, and to ensure that the assessment process considers the intent and requirements of the Fisheries Act, the Species at Risk Act and their associated regulatory and policy frameworks. The licensee should fully describe any changes to the geology and geomorphology resulting from the facility or activity, including any interrelationships with the groundwater regime. The licensee should describe any changes to the environment resulting from the removal of bedrock and/or unconsolidated deposits. The licensee should also describe the disturbance of soils or sediments that may be stockpile, used for construction purposes or otherwise perturbed. The licensee should include an assessment of changes made that would affect coastal processes and features (such as changes to the shoreline morphology due to construction, erosion or sediment transport). The licensee should describe and assess any effects the facility or activity may have on the groundwater regime including the quantity and quality of groundwater and how these effects may influence surface waters. The licensee should carry out modelling as needed to develop and test the predicted effects. The licensee should describe the effects of the facility or activity on terrestrial fauna and flora and include a full accounting of effects on species with elevated conservation status and their habitat. This evaluation should be based on results of field monitoring studies or predictions from an ecological risk assessment. The description should be clear on how predicted effects to the biota exposed to the stressor compare to the expected "reference condition" for unexposed biota on a biological population basis taking into account natural variation. Predictions of the effects should include sufficient detail to allow follow-up verification. The licensee should describe the effects of the facility or activity on ambient radioactivity. Humans and non human biota exposed to ambient radioactivity should be assessed for all relevant routes of exposure (both internal and external exposure scenarios). To support the assessment of human health (see section 3.2.7), the licensee should provide information on radiation levels to which members of the public may be exposed, including consideration of consumers of country food whose exposure pathways may differ due to cultural norms; for example, any dietary characteristics of Aboriginal peoples. The licensee should describe the potential effects of the facility or activity on the physical well-being of Aboriginal groups and other people resulting from biophysical effects, including the effects of the facility or activity on all environmental components (for example, atmospheric environment) and the resulting effects on human health. The licensee should identify any change that the facility or activity is likely to cause in the environment and any effect of any such change on the health and socio-economic conditions, physical and cultural heritage and on the current use of lands and resources for traditional purposes by any Aboriginal group including effects on hunting, trapping, fishing and gathering. The licensee should identify any concerns raised by Aboriginal people about the facility or activity in relation to any Aboriginal or treaty rights. Section 35 of Canada's Constitution Act, 1982, identifies Aboriginal peoples of Canada as the Indian (First Nations), Inuit and Métis people of Canada. A principle of radiation protection that holds that exposures to radiation are kept as low as reasonably achievable, social and economic factors taken into account. Section 4 of the Radiation Protection Regulations stipulates licensee requirements for ALARA. Minimum pollution prevention performance standards for which effluent and/or emission concentrations have been demonstrated to be achievable within an industrial sector and are therefore economically achievable across a given industrial sector. BATEA takes into account both treatment technologies and techniques used to achieve the desired effluent and/or emission concentrations. Technique includes both the technology used and the way in which the installation is designed, built, maintained, operated and decommissioned. BATEA may change over time as technologies and techniques are improved and this should be reviewed on a predetermined regular interval. Note: The DO is considered qualified to perform duties specified under the Nuclear Safety and Control Act, on behalf of the Commission. The DO may be a CNSC employee or a person otherwise employed under an arrangement with the CNSC. are linked to the same federal authority as specified in those regulations or that order. See "environmental assessment (EA) report under the NSCA" or "environmental assessment (EA) report under CEAA 2012". A liquid release of a hazardous or nuclear substance to the environment. Note: The licensee should be aware that this definition is different from that in CSA N288.6 , which define effluent as "the release of contaminants into the environment (including both air and water) as a result of a licensed activity during normal operations." An airborne release of a hazardous or nuclear substance to the environment. An emission may include point sources, fugitive emissions or area sources. Note: As further described in the Practitioners Glossary for the Environmental Assessment of Designated Projects Under the Canadian Environmental Assessment Act, 2012 , "an [environmental assessment (EA) under CEAA 2012] predicts the environmental effects of a designated project, identified mitigation measures, assesses whether the designated project is likely to cause significant adverse environmental effects taking into account identified mitigation measures, and ensures a follow up program is designated to verify the accuracy of the EA of the designated project and effectiveness of any mitigation measures". A technical assessment by CNSC staff of information required under the NSCA and the regulations made under the NSCA to inform and support the Commission's determination on whether the applicant or licensee will make adequate provision for the protection of the environment and the health and safety of persons while carrying on a licensed activity. Note: The CNSC has adopted a policy for which the process of an EA under the NSCA is used to assess the potential environmental effects and health effects for all licence applicatons that demonstrate potential interactions between a facility or activity and the environment. A report prepared by CNSC staff that documents the findings of an EA under the NSCA. On a case-by-case basis, CNSC staff determine the appropriate level of detail and content of the EA report for an EA under the NSCA, based on and commensurate with the scale and complexity of the facility or activity and taking into consideration Aboriginal, public and regulatory interest. An EA report for an EA under the NSCA describes and summarizes the results of environmental monitoring, effluent and emissions monitoring and the risks to the environment and the public. Where available, environmental compliance monitoring data and the results of any independent environmental monitoring programs (IEMP) conducted near facilities are also included. In particular, the EA report for an EA under the NSCA covers those elements of the facility or activity that are deemed to be of Aboriginal, public or general interest. Environmental management procedures or engineering technology and/or techniques that prevent or minimize the release of nuclear and hazardous substances to the environment. The part of an organization's management system used to develop and implement its environmental policy and manage its environmental aspects. An EMS consists of policies and procedures forming an integrated set of documented activities to provide a framework for effective environmental protection measures. A process that identifies, quantifies and characterizes the risk posed by contaminants (nuclear or hazardous substances) and physical stressors in the environment. An ERA is a practice or methodology primarily developed by regulatory agencies to provide scientific input to decision makers. As such, ERAs commonly serve as a supportive tool providing technical information in a manageable form to a larger EA. Measures aimed at eliminating, reducing or controlling the adverse effects of a licensed activity, substance, equipment or facility. Mitigation may include restitution for any damage caused by such effects, such as through replacement, restoration or compensation. A quantifiable variable related to the actions of a proposed or licensed activity that may cause or indicate an adverse environmental effect if a certain threshold value is reached. A limit on a performance indicator designed to prevent unreasonable risks to the environment. Note: More than one limit may be set or considered for a performance indicator. Note: Within pollution prevention, the CNSC also includes, where necessary, the use of environmental controls to prevent or minimize releases to the environment. A principle that is based on the concept that users and producers of pollutants and wastes should bear the responsibility for their actions. This concept – that companies or people that pollute should pay the costs they impose on society – is one of the guiding principles of the Canadian Environmental Protection Act, 1999. Note 1: In other words, the absence of complete scientific evidence to take precautions does not mean that precautions should not be taken – especially when there is a possibility of irreversible damage. Note 2: The â€œ"recautionary principle" is discussed in additional detail in A Framework for the Application of Precaution in Science-based Decision Making about Risk . An approach to decision making that includes risk insights as one of the factors in determining a course of action. The distinguishing characteristics, qualities, physical features and environment of the piece of land on which the nuclear facility or activity is located. A process that identifies the toxic components of an effluent or ambient medium by chemically manipulating the effluent or medium and testing the resulting material. Note: VCs are selected from the abiotic and biotic information collected as part of the baseline characterization. They may be surrogate organisms rather than actual plant or animal species (for example, a theoretical benthic feeding fish species), communities (for example, a benthic macroinvertebrate community) or specific species (for example, an endangered species), but may also include significant ecological features of the environment, such as wetlands. Canadian Environmental Assessment Agency (CEAA), Operational Policy Statement Projects on Federal Lands and Outside Canada under the Canadian Environmental Assessment Act, 2012, Ottawa, Canada, 2013. CEAA, Projects on Federal Lands: Making a determination under section 67 of the Canadian Environmental Assessment Act, 2012, Ottawa, Canada, 2014. CNSC, Generic Guidelines for the Preparation of an Environmental Impact Statement pursuant to the Canadian Environmental Assessment Act, 2012, Ottawa, Canada, 2016. CEAA, Practitioners Glossary for the Environmental Assessment of Designated Projects Under the Canadian Environmental Assessment Act, 2012, Ottawa, Canada. Canadian Environmental Assessment Agency (CEAA), Practitioners Glossary for the Environmental Assessment of Designated Projects Under the Canadian Environmental Assessment Act, 2012, Ottawa, Canada. Note: The regulatory document series may be adjusted periodically by the CNSC. Each regulatory document series listed above may contain multiple regulatory documents. For the latest list of regulatory documents, visit the CNSC’s website.